After a few weekends of disappointing titles in terms of either box office or quality or both, June ends with a bang. Three new productions enter the marketplace and each of them is certain to strike a chord with a significant portion of its target audience. 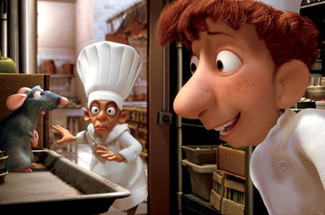 Ratatouille, the latest Pixar title, headlines the group. Live Free Or Die Hard, the fourth movie chronicling the wildly unfortunate life of fictional police officer John McClane, is poised to please a nice mix of 30-something and teen males. And Michael Moore is ready to grab more headlines with his latest critical documentary, Sicko. All three of these movies are tracking very well. Even better from their studios' perspectives, with so many disappointing tentpole titles and box office non-factor stragglers comprising the top ten, the timing for these three releases has circled from dangerous when announced to impeccable. When it comes to the promise of success in terms of both quality and box office, no one is more consistent than Pixar. The animation house that set the standard for CGI animated product, Pixar is known for its exquisite storytelling, memorable characters and attention to detail. They'll attempt to continue that winning streak with the debut of Ratatouille this weekend. Taking a look at the historical performance of their films, Pixar got its start way back in 1995 with Toy Story. Opening in 2,457 venues, the charming tale about a friendship between a toy cowboy and astronaut debut with a weekend of $29.1 million before going on to earn $191.8 million domestically (which inflation adjusts to $45.4 million and $299.4 million). Their second movie, A Bug's Life, started with $33.3 million and had total domestic box office of $162.8 million (the equivalent of $48 million and $235.7 in today's dollars). Next up was the sequel to Toy Story, which had a stunning first weekend of $57.4 million and total North American box office of $245.9 million (again, adjusting for inflation gives us $77 million for opening weekend and $330 million domestically, proving that Pixar and the Toy Story franchise had become a juggernaut by 1999).